The Rocker Stoppers nest when not in use. Weight is provided by a homemade mesh bag loaded with beach rocks. I enjoy sleeping at anchor. There’s something soothing about the gentle rocking of the hull. Gentle rocking. I don’t enjoy being jostled about when waves find their way into what had started out as a quiet anchorage. On many nights I would have traded my favorite pillow for anything that could keep my boat from rocking and let me fall asleep. Rocker Stoppers look like they’ll do the job. They’re orange plastic gizmos that look like they could do double duty as sombreros for Chihuahuas. Hung in multiples from each side of a boat, their resistance to vertical movement will help hold a boat steady. 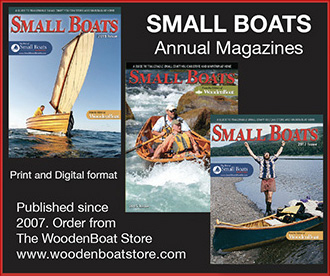 For boats up to 26′ the manufacturer recommends using three from each side of the boat with a 5- to 10-lb weight at the end of the line running through them. A mushroom anchor is suggested as a handy weight—it will nest inside the Rocker Stoppers—but I’d rather not lug two more anchors around. I used some mesh bags filled with beach rocks. In gentle waves, the kind I’d expect in a small, protected anchorage, the Rocker Stoppers, hung from the sheer, did dampen the roll. My inclinometer rolled through an arc of 10 to 12 degrees without them and about half that with them. After the Rocker Stoppers had some time in the water, the hitches capturing them on the line snugged up, widening the gap between knots and allowing more play. Getting the knots close together (solid braid line is easier to work with than three-strand line) more effectively restricts rocking motion. 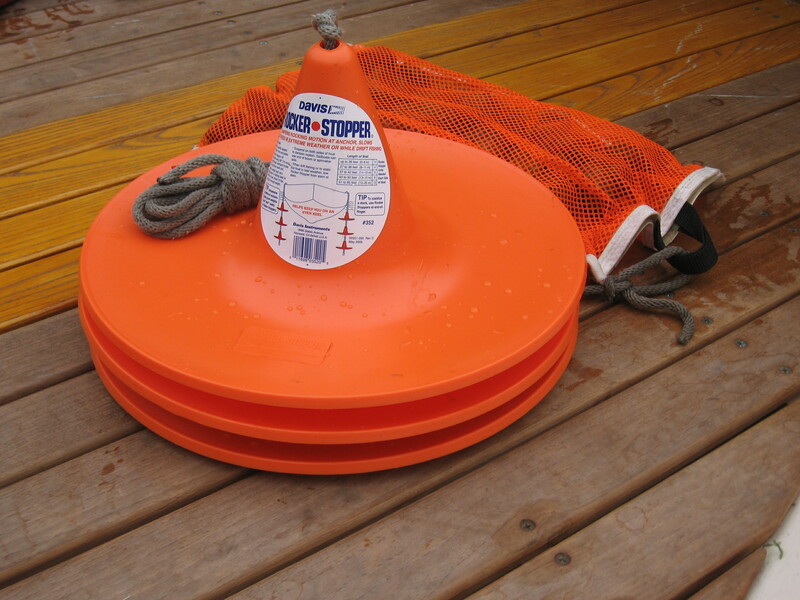 The Rocker Stoppers were most effective when deployed well away from the gunwale. A pair of oars served as outrigger booms. While deploying the Rocker Stoppers from the rail produced measurable results, there wasn’t quite the wow factor I was hoping for. The label on each Rocker Stopper says: “Sailboats can use the end of a boom or a spinnaker pole.” So I set a pair of oars up as outriggers, handles outboard and blades tucked under the opposite gunwale. The effect was dramatic. Getting the Rocker Stoppers another 5′ out from the rail all but eliminated rocking. The inclinometer wavered through only 2 degrees (see video). 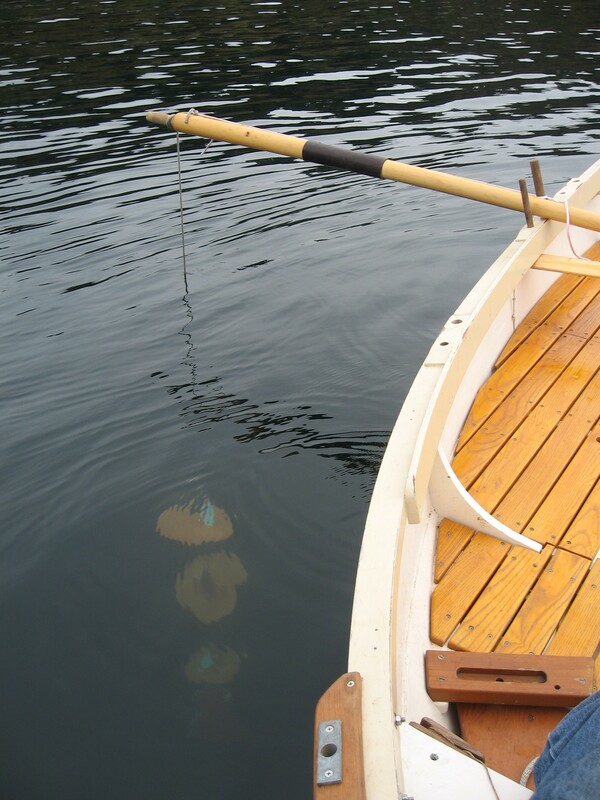 I could see the looms of the oars flex, an indication of the amount of force going into stabilizing the boat. With a little adaptation my mainmast could be employed as a single stout outrigger for both sides. I didn’t try the Rocker Stoppers in anything but small waves and rolling boat wakes. If I had to spend a night where the water was going to be choppy, I might set the boat at anchor, but I wouldn’t sleep aboard. Each Rocker Stopper is 14″ in diameter and 6″ tall. They nest compactly together when a line isn’t threaded through them, but the stack of six ready to deploy takes up some space that can be hard to find aboard a small boat. Be that as it may, I place a high value on a good night’s sleep, and the Rocker Stoppers would earn a place aboard. Manufactured by Davis Instruments, Rocker Stoppers sell for $13.99 each.